Brown bear, a.k.a. grizzly (genetic studies confirm it is the same species) historically occupied all temperate climate zones in Europe, Asia and America. Habitat loss and conflicts with humans have dramatically reduced its range. With the future of grizzly hunts in the Lower 48 still uncertain, the only two areas in North America that offer brown bear hunting are Alaska and Yukon. Russia is the prime alternative for an American who is looking for affordable bear hunting opportunities. Other countries where brown bear season is open include Estonia and Croatia. The most affordable brown bear hunts are to be found in Russia. Actually, the prices are so low that many people find them suspicious - you can fit the price for a brown bear hunt, travel exclusive, in the European part of Russia in $2,000 (read the blog story that explains how it’s possible). Prices grow along with average trophy size as you move eastward, and are just over 10,000 for the legendary Kamchatka bruins. The prime trophies and well-equipped outfitters for brown bears in the USA (Alaska), especially on the famous Kodiak island, and Canada (Yukon) command premium prices as well. Bears are not endangered in the areas where hunting is legal, nevertheless, hunting is strictly regulated to make sure populations remain healthy. Brown bear hunting in Alaska and Yukon does not require tag draw, but non-residents must be accompanied by a licensed guide. Hunting female bears with cubs is universally banned; trophy hunting discriminates against harvest of females anyway, because male bears are significantly bigger and most females don’t reach the size that will satisfy a trophy hunter. When to hunt Brown Bear? There are two main seasons for bear hunting: in spring, after the bruins leave their dens, and in the fall, before the denning time. The former runs in March to May, the latter - August to October. Both seasons are similar, in that bears feed actively, in order to accumulate enough fat for the denning, or to compensate for calorie loss during winter sleep, and concentrate around preferred food sources such as salmon runs. In addition, less dense vegetation makes it easier to locate a bear and estimate its size. But different feeding strategies employed by the bruins call for different hunting methods. In the USA and Canada the most common way of hunting brown bear is spot and stalk, especially on salmon runs when bears feed on the fish. The same way is practiced on the other side of the Pacific, in Kamchatka. In Europe most bears are hunted over bait. Russia offers the widest variety of hunting methods, including hunting with laika dogs (the hunters stalk the bear while dogs keep it at bay), hunting from improvised high seats placed where bears plunder oat fields, and hunting bear raised from its den (no, one doesn’t kill a sleeping bear in the den). Since the dawn of times, bears and humans were two similar, intelligent and omnivorous species that competed for the same environment and food sources. No wonder the idea of bear hunting still makes people very emotional, on both sides of the hunting debate. It is these primal emotions that make hunters go find bears, not the prospect of a big rug or entry in the trophy book. This said, bear meat (where it is not infected with trichinosis) is a delicacy. Brown bear hunting is dangerous game hunting, so be sure you’re packing an adequate rifle and load combination, and listen to your guide well. Classical fall hunt for European brown bear. The hunting ground is rich by good sized brown bear males, so it can be a challenge of trying one's luck hunting for this magnificent trophy together with relaxation at the unique estate. The hunt is done from stands during evening. Hunters should be ready to hunt in darkness. Moose and Wolf can be also harvested at a chance. 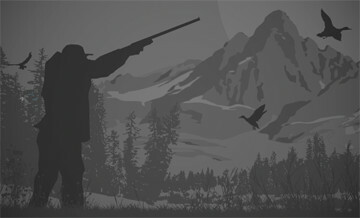 We accept minimum 2 and maximum 3-4 hunters at a time.